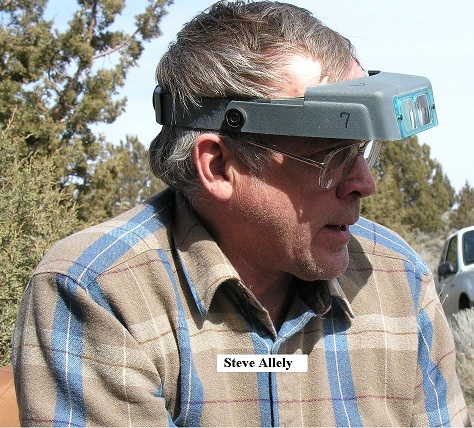 Steve Allely is a living legend amongst flintknappers in the Pacific Northwest and throughout North America. 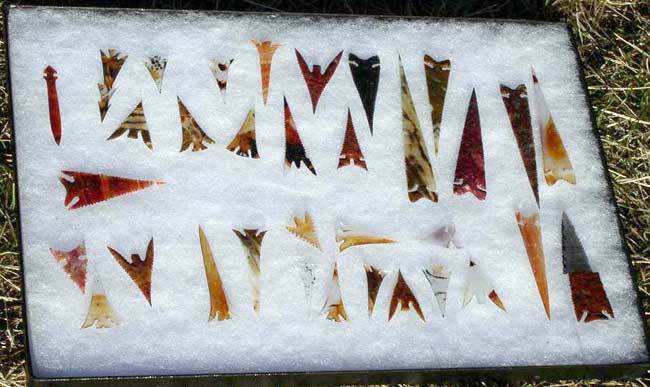 His flintknapping art has appeared in numerous editions of the Art of the Ancients Calendar though Steve himself has never submitted a photo. 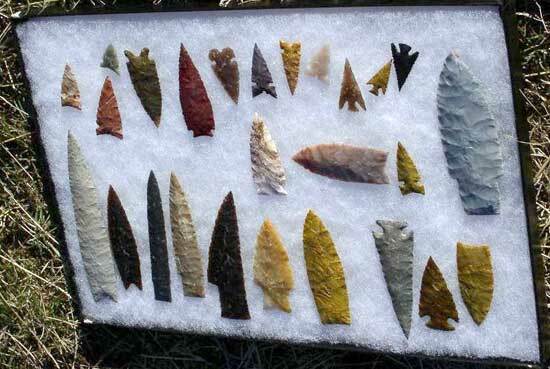 A true Master Flintknapper, Steve is perhaps best know for his Ishi Points, going so far as to not only reproduce the style but the size and material favored by Ish and using the same type of tools Ishi used. Steve is the current 'host' of the Glass Buttes Knap-in - which means he arranges and puts up the money for the Porta-Potties and keeps them stocked with toilet paper - a daunting task! While at the Glass Buttes Knap-in, Steve is very easy to locate - just look for the crowd of knappers taking lessons. Everyone from newbies to the most experienced knappers try and get a place next to Steve and learn from the Master! Steve is always willing to give advice and free instruction, whether it be to the crowd or one-on-one. 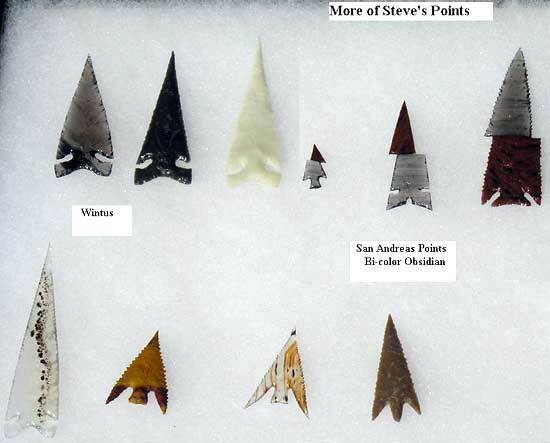 And whether you prefer 'modern' tools such as copper boppers or 'abo' tools such as hammerstones or antler tines, Steve does it all. 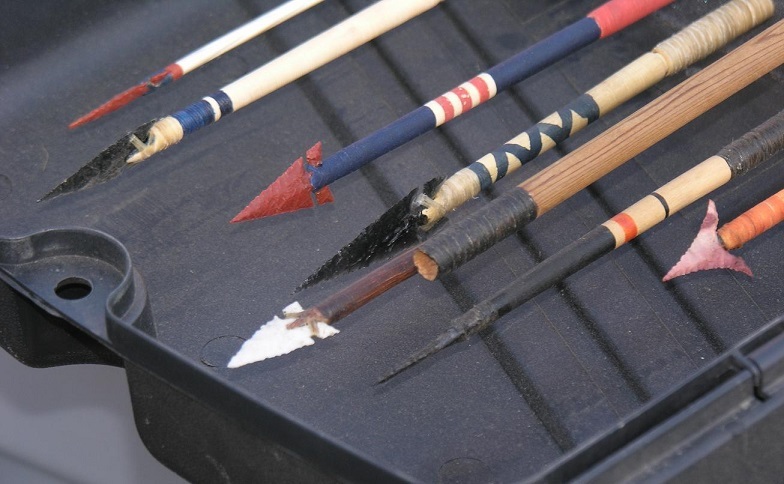 In addition to his exquisite knapping art, Steve is a master at reproducing Native American marital arts artifacts - bows, arrows, knives, etc. 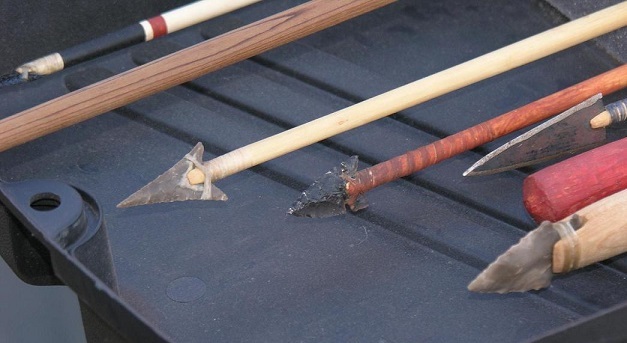 His ability to produce extremely accurate details comes from years of studying North America native tools and weapons. 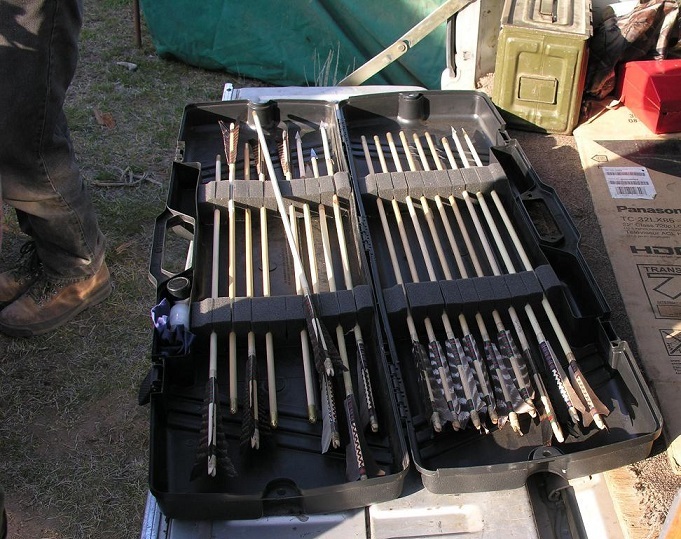 He's an acknowledged expert in this field and has lectured in several foriegn countries, including Korea. What many people don't realize is that Steve is an accomplished artist as well. Steve painting art has been featured on Oregon Public Broadcast channel's Oregon Art Beat Program and hang in the homes of some very lucky art collectors! 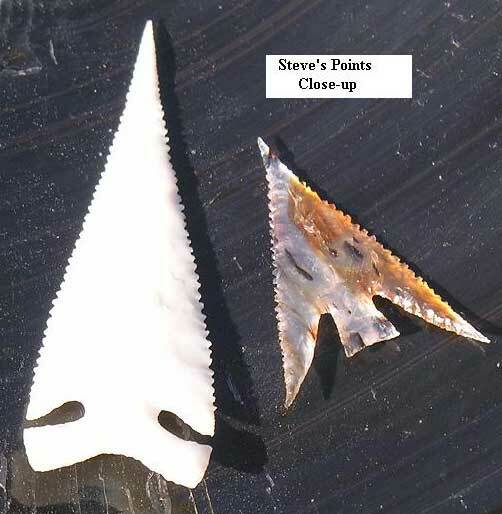 Steve has recently combined his vast knowledge of Paleo Artifacts and painting art to help museums restore ancient artifacts. A really worthwhile application of his talents! And last but not least, Steve is an accomplished musician. 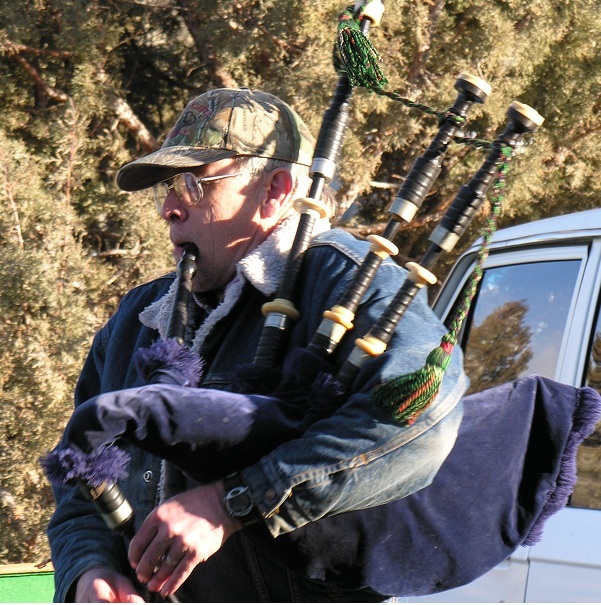 His bagpipes entertain knappers at Glass Buttes every year! 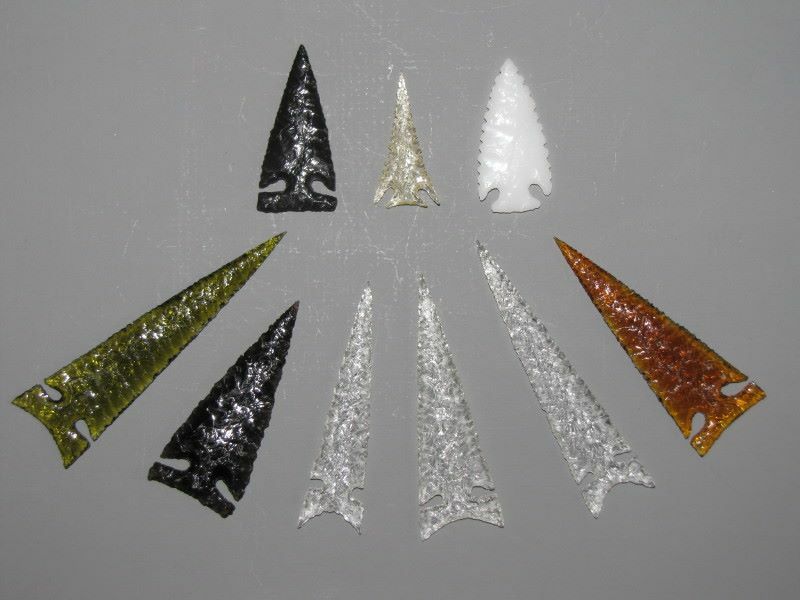 "Some glass and obsidian exact copies of Ishi points that I've been making of late. 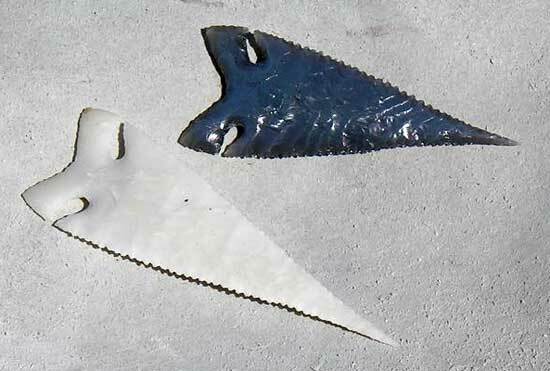 Very tricky to get them exactly the same shape, size and notch depths along with all the irregularities of the original points. These are all diamond signed lest anyone think I'm trying to make counterfeits for the wrong reasons." Is it Art or Artistry? 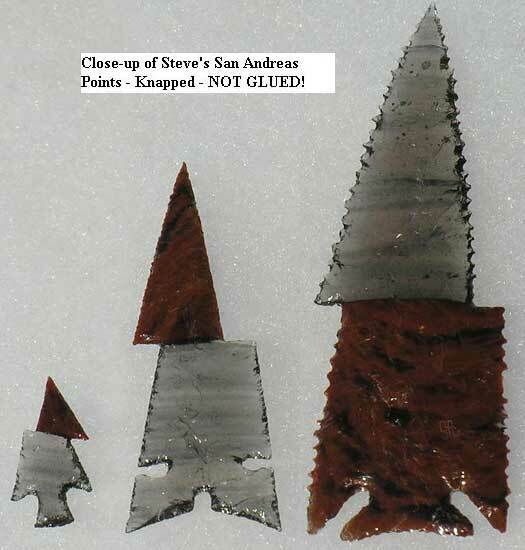 Of the four points below, the two Ishi/Winto style Points are Steves, the red point and the Mahogany Bird Point are the work of Dana Anderson - a self-taught knapper with 50 years experience. 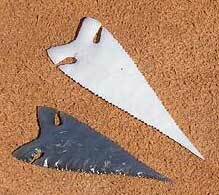 Two Ishi Points, on left about 3" long, the long one is about 12"